Manuel Pellegrini will not take over PSG, he has instead decided to take over Manchester City. 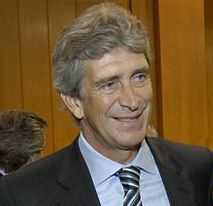 In a recent interview Manuel Pellegrini confirms the two parties oral agreement. – There should not be any problems, says Pellegrini according latercera.com. Manuel Pellegrini has recently confirmed that he will leave Málaga. Now the Chilean made ​​it clear which new club he will join. Pellegrini confirms in the television program “La Jugada” on Canal Sur in Malaga he succeeds Roberto Mancini at Manchester City’s training bench. – It is an honor that such a big club were interested. There should not be any problems with Manchester City. I have a verbal agreement with them and I hope it will be so. But I can not say I’m their coach yet because nothing has been signed, says Pellegrini according latercera.com. Manuel Pellegrini, who previously has been coaching teams including Real Madrid and River Plate, also confirmed that he had received an offer from the French Paris Saint-Germain but declined the opportunity to succeed Carlo Ancelotti (who is on his way to Real Madrid). – PSG is a prestigious club, one of the largest in Europe, who also contacted me but my desire was another. This entry was posted in Interviews, Rumors and tagged Malaga, manchester city, Manuel Pellegrini, PSG coach, Real Madrid, River Plate on May 29, 2013 by Johan Bengtsson.